I was in here on Friday night and Saturday afternoon (see below). John the governor was a great host and shed loads were raised for charity. The pub itself has 3 large TV screens and a dart board at the rear and another 2 screens at the front with a second dart board. There 3 tables out the front of the pub and another 4/5 tables around the side for the smokers and the sun worshipers. Previous contributors are right about the TV�s, as I�m sure it is great for watching the sport, but not so good when darts is on one with VH1 classic and Eastenders on the others. On the whole a great pub that I will be going back to. The chairman of Middlesex County Dart Team will be doing a 24 hour dart-a-thon in Father Ted�s starting at 6pm on Friday 6th July. There will also be other pub related events going on throughout the night and day. �1.00 per game if you lose and 50p if you win with all of the proceeds going to Marie Curie cancer care. It should be a good evening/night/morning/afternoon, so if anyone is interested just go along. I�ve been told it is a decent pub, but I will have to reserve judgement until after the event. 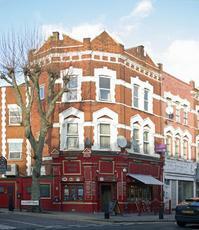 Previous owners of The Black Lion have taken this place over and most of their regulars seem to have followed them.